← YOU Get the Credit (Cash Back) on your March Bill! 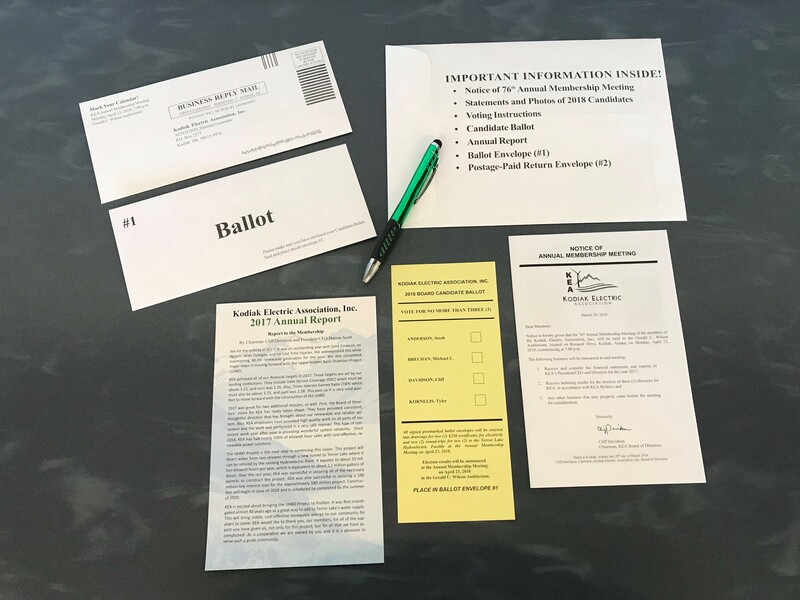 The Notice of KEA’s 76th Annual Membership Meeting, Voting Packet and Annual Report were mailed to all KEA members on March 29. Have YOU voted yet? Your signed post-marked ballot envelope enters YOU into grand prize drawings for two (2) $250 certificates for free electricity and two (2) round-trips for two (2) to the Terror Lake Hydroelectric Facility! Remember to mark and return your ballot by mail in the postage-paid envelope provided. Make your vote count…the last pickup of ballots at the U.S. Post Office will be at noon on Friday, April 20. Vote early! Election results will be announced at KEA’s Annual Membership Meeting on Monday, April 23 in the Gerald C. Wilson Auditorium. The doors will open at 6:30 p.m., and the meeting will begin at 7:00 p.m. Mark your calendar and make plans to attend this exciting community event! Every member who registers and attends the meeting will receive an Electric Energy Credit!